Kristin Gavin, Founder and Director of Gearing Up, took me on a bicycle tour of some of the programs she serves. 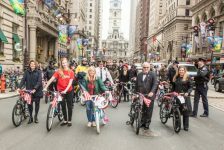 Gearing Up, which she started in 2009, has a mission to provide women in transition from abuse, addiction, and incarceration with the opportunity to safely ride a bicycle for exercise, transportation and personal growth. We talked about how the organization has changed over the years and about their upcoming spinning and yoga fundraiser, Gear Up for Gearing Up. Gearing Up was a business plan I wrote in grad school. We just found it the other day when we were cleaning out our files. It was called Shifting Gears. I wrote it in the fall of 2007 in a class called Entrepreneurship and Health Professions. Originally it was a bicycle program for adults in transition. I had been working at Interim House teaching aerobics and yoga. It’s the perfect place to start a program. It’s in Mount Airy, so it’s beautiful roads, not a lot of traffic, women were residential, so don’t get out of the house, and it had a really supportive staff. So the idea was based on the work I was doing in grad school about exercise as a platform for women to fight depression and anxiety. I realized that it could do that and much more, improving physical and social health and then helping women to get a job, get a free way to get around town, and meet new people. People like us think the bicycle can basically remedy most problems, and I really saw that play out. It started at Interim House and grew to two other community programs, then we started a spin program at the prison (Philadelphia County Women’s Prison, Riverside Correctional Facility) in 2011. Nearly all women with whom we work come to the program overweight or obese, because 80% of the women are coming from jail. Over the course of a year, national statistics have women gaining around 40 pounds over their first 12 months in prison. The idea was let’s start getting women riding with us while they’re still incarcerated, and let’s see how many we can see post-incarceration. We now have four community partnerships at Interim House, CHANCES, The Joseph J. Peters Institute/Project Dawn Court, and Gaudenzia Washington House [we rode by three of them], plus the Earn-a-Bike program which is accessible to any woman who completes the program outside the prison. Pedaling toward Gaudenzia Washington House, the next stop on our tour. It’s a citywide indoor cycling and yoga fundraiser. We have about 300 spots available. Each spot goes for $45, with the exception of the yoga classes, those are donation classes. The other option is setting up a fundraising page. Instead of donating, they can set up a page, and commit to raising a hundred dollars from friends and family (and get a free spin class). The other piece is engaging the community in the work we’re doing. There’s a Gearing Up representative or two at each site, so people  from the cycling community, the spinning community, the yoga community  come out and it brings Gearing Up to life for them in a way they may not have experienced if they have not been able to come out and ride with us. I think success has been making that shift where we have built a culture, built our core competencies, and determined what is important to us. Now we can serve more women with more staff, and continue to do it in a meaningful way, which is a huge leap for us. Another measure of success is traffic on Facebook, the office line, and in the office. Women are checking in. There is chatter, there is movement, there are women knocking on our window when they walk by. They’ll call. I think that ripple effect has taken a while as there are more and more women who have graduated from our program, there are more alumnae out and about. That’s a big indicator of our success. Now we can serve more women with more staff, and continue to do it in a meaningful way. We’re very proud of the partnership we’ve had with Wash Cycle Laundry, which has employed five women in a variety of capacities. It’s been really eye-opening to see the impact that community partnerships can have when an employer hires based on the reputation that we have, that we are going to do things with integrity, that we are going to refer women to you whose futures we believe in, who have demonstrated that they are ready to start working. The employee, the employer, and this organization that connected them all believe in this; we’re all a part of this. I would say that the thing really important on Gearing Up’s horizon is meaningful community engagement. If part of our mission is to provide women with the opportunity for physical, emotional, and social health using the bicycle as a vehicle, it’s really important that we’re meaningfully engaging in a community that can help provide those opportunities. We want you to come to a volunteer training session and really check in. Then come out and ride with us and meet people, meet women who are in this process and learn more about what it’s like and share your passion for the bicycle, share your passion for being out. There’s no better way to get to know someone that you don’t know than going on a bike ride with them. You have a shared experience. How normalizing is that for everybody? After a ride or on the ride home, the women will say, I can’t believe all of those people came and rode with us. It’s really meaningful. Connect with Gearing Up through Facebook and Twitter. Want to volunteer? Contact Us. Spots for Gear Up for Gearing Up are filling fast, so if you want a seat (or saddle, rather) register now.